1. 4 2/8" x 5"
2. 4" x 4 6/8"
3. 2 1/16" x 2 15/16"
4. 1 15/16" x 2 5/8"
5. 1" x 1 6/8"
1. 4" x 4 7/8"
2. 2 6/8" x 4 11/16"
3. 3 1/8" x 3 15/16"
4. 2 7/8" x 3 6/8"
1. 3 1/8" x 4"
2. 2 15/16" x 3 6/8"
3. 2 1/8" x 2 7/8"
4. 1 7/8" x 2 5/8"
Tag: (2 pcs) 2" x 3 1/2"
Corner: 2 3/8" x 2 3/8"
Border: 8 1/16" x 1 9/16"
1. 4 3/8" x 6 5/16"
2. 1 6/8" x 3 5/8"
1. 4 2/8" x 4 15/16"
2. 3 6/8" x 4 1/2"
3. 3 1/2" x 4 2/8"
4. 2 3/16" x 2 5/16"
5. 1 15/16" x 2 1/16"
1. Largest die (background shape): 4 1/2" x 5 3/16"
2. Die: 4 3/16" x 4 7/8"
3. Medium background die: 3 7/16" x 4 3/16"
4. Die: 3 2/16" x 3 7/8"
5. Small center die: 1 15/16" x 2"
Largest shape die (background die): 3 3/8" x 4 3/16"
Large shape cutouts: 3 15/16" x 3 3/16"
Small shape die with cutouts: 1 15/16" x 2 1/16"
Corner: 2 1/8" x 2 1/8"
Border: 1 1/2" x 8"
1 piece - Size: 4 2/8" X 6 2/8"
Size: 2 2/8" x 6 2/8" x 2" x 6"
1. 2 1/8" x 6 1/8"
Largest flower: 2 6/8" diam. Size: Largest flower 2 11/16"diam. Sizes: Largest butterfly: approx. 2 5/16" x 1 15/16"
smallest butterfly: approx. 4/8" x 3/8"
1. 1 1/2" x 2 6/8"
2. 2" x 2 6/8"
3. 1/2" x 1 3/8"
Sizes: Finished bow size approx. 2 1/4" x 1"
Sizes: Finished bow size approx. 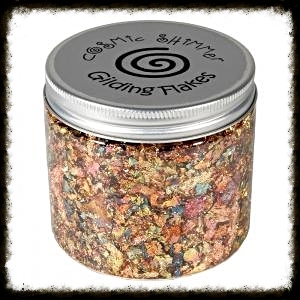 2 1/4" x 6/8"
Size: 3 6/8" x 3"
Size: 4" x 3 2/8"
Cosmic Shimmer Flake & Glitter Glue is a smooth, fluid adhesive that remains tacky when applied to any craft surface, until a medium is fixed to it. Flake & Glitter Glue can be applied to rubber stamps using sponge or foam, then stamped onto cardstock and covered with Cosmic Shimmer Gilding Flakes (Item #CSGF) to produce sparkling stamped designs. The Glue can also be sponged through mask designs and stencils onto projects. Bottles contains 30ml. If applying the glue with a stamp ensure you wash the stamp immediately in warm water. 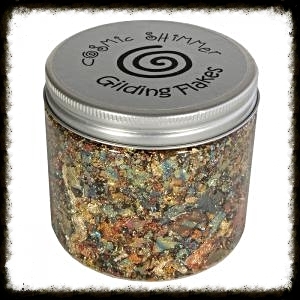 Use with Cosmic Shimmer Flake & Glitter Glue (item #CSF01) or with double sided tape. Thank you SO much for selling these products! I have wanted to purchase them, but shipping from England was too expensive to justify the purchase. I cannot wait to try these out.